The perfect gift for any Nintendo or Pokemon lover. You get the bundle of the 2DS and Pokemon game, meaning all of Christmas Day they can sit there playing their new console and you can feel so happy that they appreciate your gift. I know I’d love to buy this for my boyfriend for Christmas but my budget simply doesn’t stretch that far! If you want to buy someone a fun game that you can join in with too, this is the game to buy! I love Singstar and I have ever since PS2. It is such a fun game that you can play alone or with loads of others at a party! This Singstar is great too as you don’t have to buy the microphones, you can just download the app on your phone. Minecraft is a never ending game literally. You can be so creative with it and have hours of fun and laughter. Children and adults alike love this game, I certainly get enjoyment out of it and it is a winner. I love how it has classic 8-bit graphics! Everyone has heard of GTA and I bet it is at the top of most gamer’s wishlists this Christmas. It recently came out for PS4 and Xbox One, so everyone that sold their previous console can finally play it again. Even after they’ve completed all the missions, they can go online with their friends and just have fun online doing heists (when they finally release them). Little Big Planet is so cute, I love this game so much. I had the first and second ones on PS3 and I actually got to try out LBP3 at Summer in the City with Chloe. It was so fun! If you know anyone that loves this game or a child that owns a PlayStation, seriously consider buying this for them, they will love it. 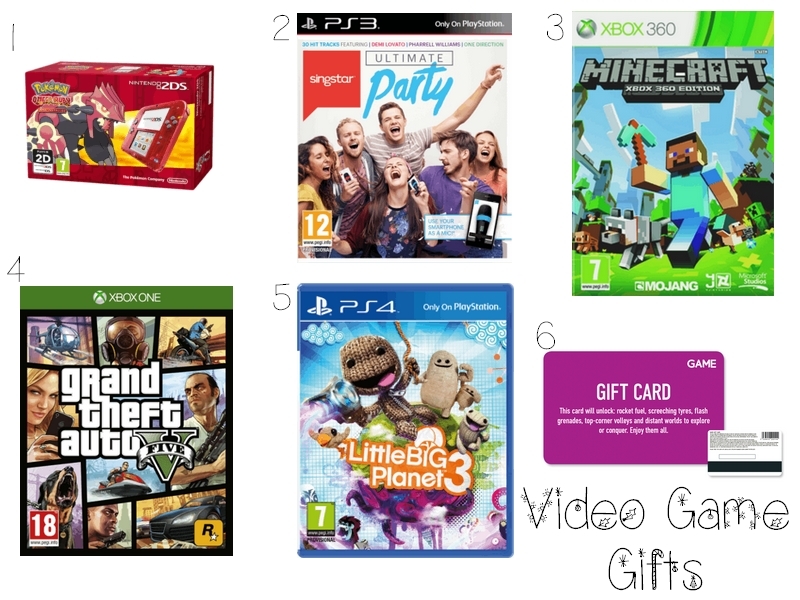 If you know someone loves games but you don’t know exactly what game they would love to get or your budget is less than the game they’d like, you can help them towards it with a gift card for Game. I know how much us beauty bloggers love to get our Boots and Debenhams points, I also know a fair few people that love to build up their Game points, hence why I chose a gift card from there!